Ministry of Justice, International legal co-operation and European affairs directorate, Sofia, Bulgaria. Appropriate legislation is fundamental to ensuring the highest level of health protection and effective innovation. Until the 1990s, each European Union country had its own approach to device evaluation but governments needed to put in place policies that will address all elements related to medical devices, ranging from access to high quality, affordable products, through to their safe and appropriate use and disposal. In order to ensure that patients, consumers and healthcare professionals can reap the benefits of safe, effective and innovative medical devices, the European Commission has proposed two new Regulations. The first proposal is for Regulation on medical devices and is to replace Directive 90/385/EEC regarding active implantable medical devices and Directive 93/42/EEC regarding medical devices, while the second proposal is for a Regulation on in vitro diagnostic medical devices and is to replace Directive 98/79/EC. The proposed Regulations foresee to amend and clarify the scope of the legislation, to take into account scientific and technological progress. Key words: Medical devices, legislation, innovation, patients, healthcare professionals. Please cite this article as: Yaneva-Deliverska M. NEW PROPOSAL FOR EUROPEAN UNION REGULATIONS ON MEDICAL DEVICES AND IN VITRO DIAGNOSTIC MEDICAL DEVICES. J of IMAB. 2012; 18(3):360-362. 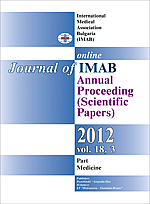 DOI: 10.5272/jimab.2012183.360. 6. European Commission, Proposal for a Regulation of the European parliament and of the Council on medical devices, and аmending Directive 2001/83/EC, Regulation (EC) No 178/2002 and Regulation (EC) No 1223/2009, COM(2012) 542 final. 7. European Commission, Proposal for a Regulation of the European parliament and of the Council on in vitro diagnostic medical devices, COM(2012) 541 final.